Making Paleo Jerky is half science, half art. Staying True to paleo ingredients means skipping the short cuts that only help the bottom line. We believe that when you check the deck of your convenience foods, the ingredient list should contain REAL FOOD. Chemicals you can’t pronounce and processed sugar in all it’s hidden forms might prolong shelf life and add flavor, but it’s not something we believe in doing. Ever. I will continue innovating products while keeping my promise to stay true by using paleo ingredients. I never want to be the paleo police, and on occasion I love indulging in some of my non-paleo favorites. But I know I feel my best when I keep sugar, gluten and most starches out of my diet. My stomach thanks me for it. If you feel the same way, I welcome you to shop with ease at stevespaleogoods.com for your Dried Fruits, Grainless Granolas, Paleo Sauces, Paleo Stix and Paleo Jerky. Now that the demand for protein is higher than ever before, the meat snack business is estimated to be worth $2.5 million annually! Of course the overwhelming majority of those sales come from the mega players in grocery aisles and convenient stores, dedicated to mass quantity and distribution. In order to scale up to MEET demand for this MEAT, most of these products are anything but paleo. As with most packaged food, the marketing is spot-on and the packaging is clever, but the ingredient deck tells the real story. I think it’s good practice to pay very close attention to the ingredient deck, no matter what you are eating. The ingredients are listed in order of highest content per serving. I like to scour the meat snacks in retail stores to check out what’s listed second, because BEEF or BEEF JERKY is always listed first. In most of the mainstream meat snacks, SUGAR is listed second, often called “cane” to appear more natural. No matter how you list it, sugar is sugar. Our line of paleo jerky comes in a 2oz serving size, and it never has over 2g of sugar derived from fruits, real maple and honey. We aren’t the sugar police, but our promise to you is that our complete line of PaleoGoods will never ever contain added sugar. Speaking of, here’s another trick that companies use to make nutri-facts look cleaner. Some resealable bags will be 3oz but list the serving size as 1oz. If a 1oz. serving of jerky contains 11g of sugar, that’s comparable to a 1oz. serving of chocolate that has 14g! And if you eat 2oz at a siting (or even 3oz because when you’re ravenous it’s easy to do) you could be ingesting upwards of 20-30g of sugar in your meat snack. Kind of makes you wanna reach for a Snickers Bar instead, which has 27g. 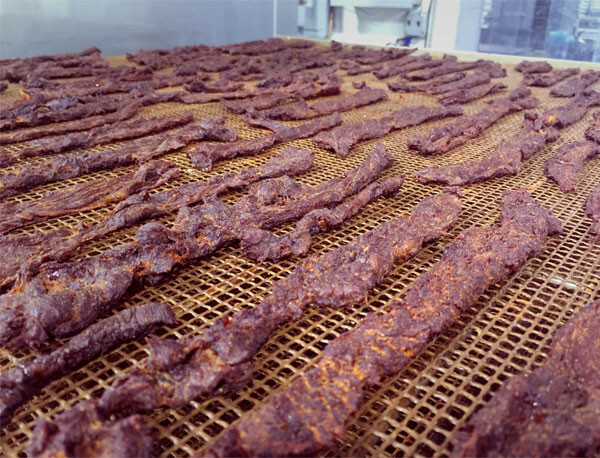 Our paleo jerky is trimmed and sliced by hand and after we smoke it slow and low, it looks like dried steak. If you are enjoying a meat snack and it’s uniformly shaped, chances are you are eating protein that has been pulverized. These meat snacks are created by grinding hamburger-like meat into paste, then using a machine to produce closely-packed strips. This process known as “chopping and forming” greatly reduces the protein content while making an evenly shaped product. Fillers like soy, starch and sugar are added to make up for the lost protein and increase profit margin. Check out our delicious flavors like Caribbean Key Lime Artisan Jerky—with a whopping 22.5g of protein per 2oz pack and only 1g of sugar. The leading jerky found in supermarkets also has a lime flavor—with 11g of protein per 1oz serving and 11g of sugar. That’s 50% less to eat, 50% less protein content and 5 times the sugar found in ours. When you’re paying for protein, that’s what you want. Check out all of our Paleo Jerky today, and be protein prepared when hunger strikes!